Ten teachers have been recognized for making a difference through the Nova Scotia Teachers Union’s fourth annual Teachers Make a Difference program. 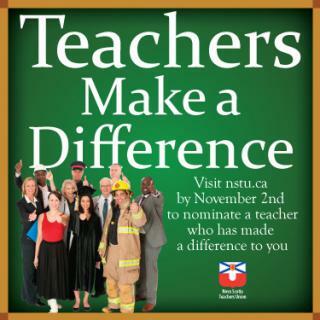 The NSTU members were randomly selected among 308 nominations representing 227 teachers. The following NSTU members are being recognized as teachers who make a difference: Holly Alick, a math and art teacher at River Hebert District High School, Cumberland; Kelly Barteaux, English Department Head teacher at Auburn Drive High School, Dartmouth; Cindie Collette Conrad, Grade 5 teacher at École Bois Joli, Dartmouth; Janice Gavin, an APSEA teacher working with deaf and hard of hearing students in the Halifax Regional School Board; Maria Gorman, a Grade 1-2 teacher at Carleton Consolidated School in Yarmouth; Muriel Hill-Latimer, an English teacher at Riverview High, Coxheath; Stephanie Hunt, a Grade 7 teacher at Bluenose Academy, Lunenburg; Dana Jewers, a Grade 5/math teacher at Fanning Education Centre, Guysborough; Jo Anne MacDonald, Continuing Care faculty member at the Strait Area Campus of the Nova Scotia Community College; and James Wiseman, a math teacher at West Kings District High in Auburn, Kings County. This year’s campaign, which was launched on World Teachers’ Day October 5, encouraged students and/or parents to nominate a teacher who has made a big difference in their lives, and contributed to their school and community. All recipients receive a $300 donation for their school or campus breakfast/food bank or library program. Some of the reasons cited by students in their nominations as to why their teachers make a difference include: encouraging students to do their best, providing support, dedication, caring, patience, making learning meaningful and fun, kindness, confidence building, going above and beyond, being an inspiration, and showing how to think outside the box. “Recognizing the hard work teachers/and community college members do above and beyond instruction is important to reflect their passion for students and learning,” continues Morse. From November 9 to 30, a series of 15-second spots featuring student testimonials, and announcing the winners will run on TV programming. “We’d like to acknowledge the staff, students and parents of Southdale North Woodside School, Eric Graves Junior High and J.L. Ilsley High who helped us demonstrate how teachers make a difference,” adds Morse. These spots will also be posted on the NSTU’s website at nstu.ca through its YouTube station at youtube.com/nstuwebcast. The Nova Scotia Teachers Union represents more than 10,000 public school teachers, Community College faculty and professional support staff and teachers who work for the Atlantic Provinces Special Education Authority. Since 1895, it has worked to improve the quality of public education in Nova Scotia.